Monday I bought some sparkling water, a can of soup, some candy, a few bananas, and chicken breast. I spent $13.35. Thursday, still on vacation, I went to Albertsons for jam, applesauce, more lemonade, milk, and fruit for breakfasts. I got bananas, red grapes & green grapes. I spent $18.43. I also found a receipt from an earlier week for a gallon of organic milk. $5.99. Monday I went to Costco and spent $142.91. I bought turkey roll-ups because my mom loves them and was coming to visit, 2 3-jar packs of organic spaghetti sauce, organic half & half, organic peeled garlic, 2 cases of coconut milk, a 4 pack of applesauce jars, a 3 pack of turkey lunchmeat, organic meatballs, 2 bags of organic tortilla chips, organic sugar, organic coconut oil, and something else for $8.59 that isn't clear from the receipt. I also stopped Monday night late at Fred Meyer. I bought organic chicken thighs, a loaf of Udis bread, a gallon of organic milk, & spicy cheese curds on clearance. I spent $20.38. Thursday I went to Champion Foods and spent $22.50. The receipt wasn't detailed but I'm sure it was groceries. I also went to Fred Meyer Thursday. I got a Daiya pizza, 5 big boxes of cereal for $2.09 each, Nabisco crackers for $1.79 each, a bottle of lemonade for $1.49, 8 cheap pizzas for $2.04 each, a bag of frozen french fries, a box of corn dogs, and two bricks of Tillamook cheese for $4.99 each. I spent $64.41. Friday I went to Fred Meyer again to pick up wine for a visit with a girlfriend. I bought clearance deli salsa, clearance cheese curds, clearance yogurt, clearance udi's bread, clearance hot dog buns, clearance vanilla creamer, and another loaf of Tillamook on sale for $4.99. I spent just $18.23 on the food! I dashed into Albertson's on Wednesday for some salad mixes. We were providing salad that night for a temporary homeless shelter at our church. I spent $12.00. Friday I took a kiddo shopping with her birthday money to Fred Meyer. 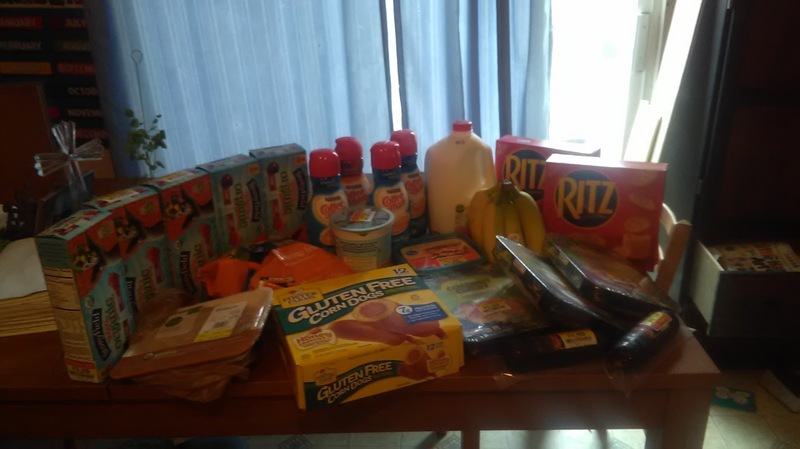 I bought 2 tubs of sour cream, creamer, 2 loaves of bread, organic cottage cheese, 2 bags of Daiya cheese, a markdown produce bag, a box of Daiya mac'n'cheese, 5 bags of goldfish, a loaf of Udis bread, and 10 chocolate bars for $.50/each. I spent $42.23. Saturday we had to take tapas to a party and again, I had no time to prepare something. So we picked up some marinated olives & artichoke hearts on the way to the party. I assembled them on a plate when we got there. We spent $19.40. Wednesday I was at QFC for milk & fruit. When there I found organic whole chicken for $2.02/lb. I bought 4 of them! Also organic celery, some nectarines, peaches, bananas, and some Hershey's candy. 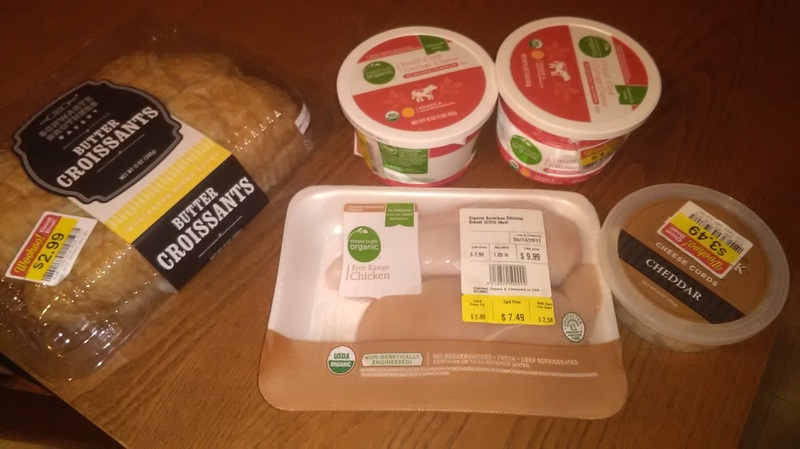 Also on clearance I found a Kroger pizza for $2.99, a package of croissants for $2.99, some chicken breast & GF cupcakes. I spent $74.30. I was back at QFC Sunday again for milk & 3 bags of chips for a potluck. I also got donuts on clearance, 2 theo chocolate bars, & 4 tubs of organic yogurt. I spent $27.85. We were out of town the first part of the week. On Wednesday Ed went to the store for milk & picked up some organic candy for DD2. He spent $8.49. We had come home with a cooler full of food so we didn't shop much otherwise. We camped all last week. Monday I went to the store to buy supplies. No photo. Fred Meyer was local to the campground - Hooray! I got a gallon of organic milk and organic half & half. I got dairy free milk, granola bars my gf/df kiddo loves, a dozen eggs, marshmallows, coffee, Hershey's syrup, regular syrup, bananas, hot cocoa, a can of clearance diced tomatoes, grapes, mangoes, & pears. I spent $47.87. Midweek I picked up a couple more things at Wal-Mart: a head of lettuce, apples, gluten free hot dog buns, & 2 bags of potato chips. I spent $18.72. DH picked up a gallon of milk one day, too, but not organic. Estimating $3.00. Normally at this time of year I am buying bulk produce like crazy and canning/freezing. I'm just swamped with LuLaRoe & trying to still get my house in order after the remodel. I might still get some raspberries & blackberries. And I'm definitely planning to get apples for applesauce since the girls can can that themselves. We were home during Week 32. Yay! But I did drop my older girls at camp & had to provide lots of gluten-free, dairy-free food alternatives for DD2. On the way to camp Monday morning I stopped at Fred Meyer for daiya mac'n'cheese, organic (no food coloring) candy, and a few apples for home. I spent $8.58. Late Monday night I picked up a gallon of organic milk for $5.99. Friday I was back at Fred Meyer for our Bible study potluck contributions & got some camping groceries while I was there. I found ground turkey on clearance for $0.99/lb! I got another gallon of organic milk, a daiya pizza, 2 loaves of bread, salsa, olives, green chilies, guacamole, cheap tortillas, roma tomatoes, organic half & half, & bananas. I spent $37.28. On the road to camping Sunday we needed a potty in a hurry so stopped at Safeway. I bought some candy for the car. It was $3.99. We were camping most of the week, but I was assigned to the big group dinner on Wednesday. I brought DD4 back to town for an appointment Tuesday and stopped at the grocery store for what I needed. I spent $54.63 at Haggen on 10 pounds of ground beef, 2 containers of guacamole, and 3 bags of Daiya cheese since it was on sale for $3.99. We got home Friday and I headed out shopping since we were pretty darn close to out of food after camping all week and the cousins the week before. Costco was up first. No photo, but I bought a ton of microwavable meals since we were in the middle of a heatwave in Seattle. With no AC our house is over 80 by dinnertime & there was no way I was cooking. I bought organic lemonade (DH is big on citrus lately. He never, ever wants a kidney stone again), a case of coconut milk, 10# carrots, a watermelon, turkey lunchmeat, pork tamales, a bag of pears, bananas, beef taquitos, & 2 bags of organic tortilla chips. I spent $95.59. Then I headed over to Fred Meyer - again, no photo. 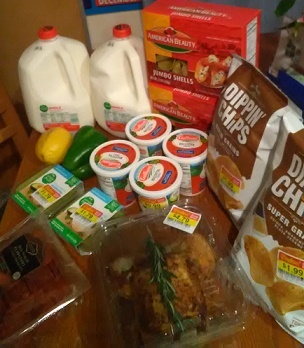 I bought a gallon of organic milk, organic half & half, 2 giant bottles of coffee creamer, 4 packages of frozen microwave cheesy noodles with broccoli, corn dogs, gf chicken nuggets, a bit of smoked cheddar, daiya pizza, 3 big deli pizzas on clearance for $4.49 each, big packages of pepperoni on clearance for $3.79 each, red grapes, green grapes, bananas, 9 more packages of gluten-free organic pasta that had peelies making it just $0.64 per package! I spent $89.09. This week was a bit of recovery after being out of town. I went to Costco Monday and picked up organic apples, a watermelon, organic flour, organic tortilla chips, organic Amy's snacks, organic kids Clif bars, 'natural' turkey lunchmeat, chicken breast, wheat bread, & tortillas. I spent $104.55. I found a bunch of clearance pizza kits at QFC on Friday morning. We hosted our couples Bible study and grilled the chicken I bought at Costco on Monday. I thought I was making pineapple-steak skewers, too, but I just ran out of time. I did buy steak and pineapple though. I also bought yogurt on clearance, organic whole milk and 2% on clearance, nitrate free sausage on clearance for $1.99 each package, organic tomatos for $0.99 on clearance, bananas, & 2 small yogurt cups. I had the $10 off $40 coupon and spent $41.09 after the coupon. Finally, today I stopped at QFC & picked up 2 gallons of organic milk, a pint of half & half, & a dozen doughnuts. I spent $18.76. 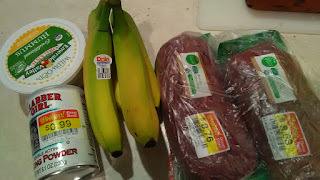 Monday I was at QFC for milk, half & half, & fruit and I found lots of other goodies including organic jam for $1.09 each jar, fruit squeezy pouches were $0.99/4pack, relish was $1.29, Annie's mac&cheese was $0.49/box, and a can of organic corn was $0.89. I was happy to find organic gf cereal for just $1.49/box and I pick up Sour Supreme for DD2 because I happened to remember we were out. 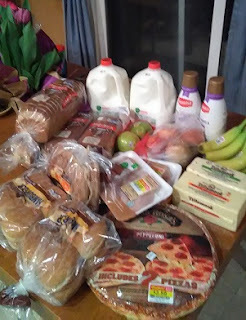 With the organic milk, organic half & half, bananas, & grapes ($0.99/lb) I spent $45.61. I stopped in at Trader Joe's and picked up a bell pepper, organic pears, & organic romaine. I don't know why I picked TJ's. I almost never go there. I spent $6.17. 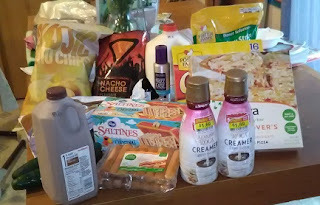 I popped into QFC again Wednesday beause I had a $10 off $40 coupon & I needed coffee creamer. I bought the kids some chocolate milk and I got orange juice for a recipe. I found mango peach salsa on clearance - yum!, as well as organic sour cream for $1.49 each, and clearance organic Honeycrisp apples that were $0.99 for 3 in a bag! I also picked up organic stew beef that was on clearance for $7.99/lb. Crazy that meat costs so much, but I just try to make it stretch by cutting into smaller, bite-size pieces and adding more veggies to the stew. My total was $53.41 before the $10 off, so I spent $43.41. I know I go to QFC a lot. My closest 2 grocery stores mainstream are both QFC! I was happy to find more organic cereal on clearance for $1.49/box and $1.69/box. Tillamook was $5.99 for 2# block so I picked up some Jack along with Daiya for DD2. I got more half & half, a sack of 5# potatoes & corn dogs for easy lunches. 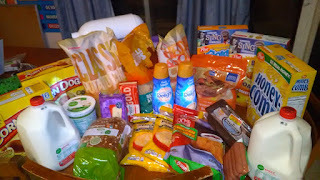 Bananas rounded out the shopping & I spent $30.74 on Friday. I couldn't find the photo for this last shopping trip on Sunday night - also to QFC to use another $10/$40 purchase coupon. I bought 2 gallons of organic milk, a case of organic lemonade for $1.00 each, creamer for DH, another brick of Tillamook cheese for $5.99, bananas, a ball of fresh mozzarella on clearance for $1.99, and (to push me over the $40 mark) I let the kiddo with me choose 3 bags of chips that were 3/$5. I spent $42.08 before the coupon so it ended up $32.08. In Colorado my sister-in-law and I shopped a lot. She's learning about the gf/df diet and I didn't want her to have to feed my big family so I picked up a lot of the groceries. First we went to Natural Grocers, a health food store on Monday. I bought some granola bars for DD2 to have snacks at VBS and for the airplane ride home. I also got some cookies for dessert/snacktime during the week. I spent $10.53. We went to Target for curtains and I picked up regular granola bars for the other kids. It was a huge box of 24 for $5.54. Sales tax in Colorado includes food so all the prices are a tiny bit higher. Wednesday was Whole Foods for dairy free sour cream and I bought some Caprese salad at the deli because I was starving. I spent $8.97. Week 24 was a bit frantic. Mom finished up her visit, we had a couple of days of packing & Lularoe, and then we were in Colorado at the end of the week. I was trying to use up what we had on hand before leaving town at the start of the week. I didn't take any grocery photos. Thursday I picked up a gallon of milk for $2.99. It was on clearance and I figured we'd use it before we left. Friday we dropped those lasagnas at church on the way to the airport. Saturday my sister-in-law and I shopped in Colorado. I bought organic milk, daiya pizza, daiya brick cheese, clearance romaine hearts, two loaves of garlic bread, coconut milk, and a loaf of gluten free sandwich bread. I spent $34.62. I stopped into QFC for a couple things my Mom asked me to pick up and found some crazy deals. GF crackers were just $0.39 so I bought 6 boxes. Canned pears were just $0.39 so I bought 10 cans. There were probably 50 cans, but I prefer to give my kids fresh fruit or organic fruit that I've canned so I stopped at 10. There were also squeeze fruit pouches for $0.99/box. I bought 10 4-pack boxes since they were at my $0.25/ea price point. Organic milk was on clearance for $2.99 each, and organic cottage cheese was on clearance for $1.49. I bought grapes that were on sale for $1.48/lb, bananas, a trio of green bell peppers on clearance for $1.00, a package of gf/df meatballs, a bag of fritos, a bag of goldfish, and clearance organic hot dog buns. 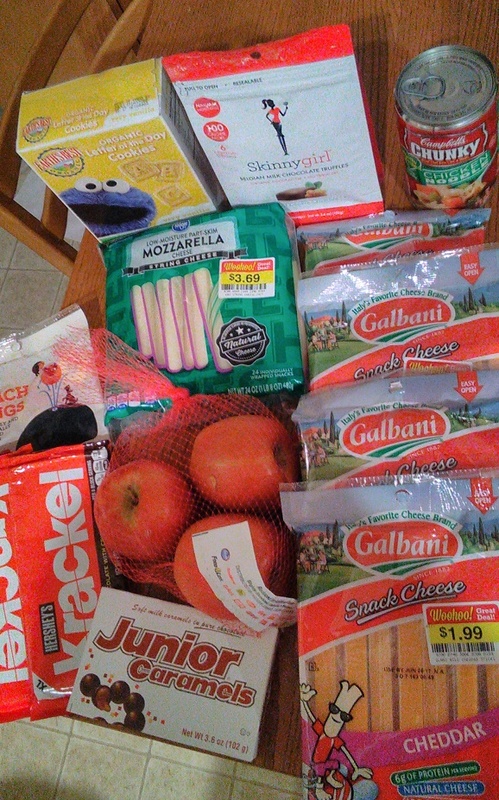 I also got a clearance deli chicken, and 2 more clearance GF pizza crusts. I spent just $51.88 on ALL THIS! My friend Stephanie told me about a new Cash 'n' Carry so I went to check it out when I was in the neighborhood and had about 10 minutes to squeeze in a stop. I bought 2 mangos, a hand of bananas, a pack of zucchini, 18 eggs, and a #10 can of applesauce. I spent $15.67. DH stopped at the store for me once this week, too. He picked up a pound of butter and a bag of chocolate chips along with some vitamin water for himself. He spent $11.88. Late in the week my mom went to the store and picked up a few things for me including a gallon of milk, some strawberries, some peaches, eggs, and a couple other things I don't remember but it was about $20 and I gave her $20. Wow, I am behind in posting. It's been crazy around here with contractors every day and the launch of our Lularoe business. I didn't even take all the photos I usually take, but I do have all the receipts for accurate records. First shopping trip was QFC on Monday. I bought a red bell pepper, guacamole, some fruit popsicles and ice cream sandwiches, and I found GF pizza dough on clearance for $1.49 as well as nitrate free chicken sausage for $1.99/lb. I spent $24.25. I dropped in at Costco Tuesday for a watermelon and 3 loaves of Udi's GF bread that was on sale. 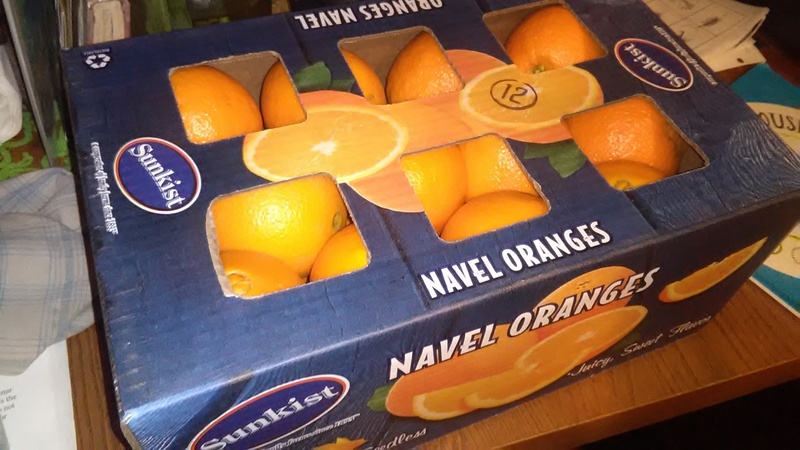 I also picked up a six-pack of mangos. I spent $28.45 on food. No photo. Wednesday I went to QFC to grab corndogs and milk. I found some frozen dinners for $0.79/each and I like to pick those up for DH lunches since we have leftovers less and less for his lunches. I picked up brown sugar and some clearance baby food, some bananas, and some gf hot dog buns. I spent $32.65. We also made a quick stop into Trader Joe's for GF oreos & GF/DF potato chips. I spent $9.97. I stopped in to QFC again Friday (it's just closest to my house) because I needed more chips for our Small Group potluck. I bought 3 bags of chips for $5.64. No photo. Finally, I had a quick trip late at night Saturday to Fred Meyer to pick up a last minute birthday gift for DD#3. She also had requests for her meals I needed to accomodate. I bought 4 boxes of annie's mac'n'cheese, some daiya shredded cheese, So delicious ice cream, bananas, & a gallon of organic milk. I spent $20.60 altogether. Oh Gosh - There was so much shopping this week. I love the Founder's Day Sale at Fred Meyer so I visited a lot. It all started Monday when I stopped for milk & hot dog buns and happily realized my favorite sandwich bread was just $0.99, 2# bricks of Tillamook were just $4.99, and there were lots of clearance deals! Hamburger buns were $0.59 each, double pack of pizza was $3.59, organic chicken breast was $3.59/lb, organic granny smith apples were $1.00/2. 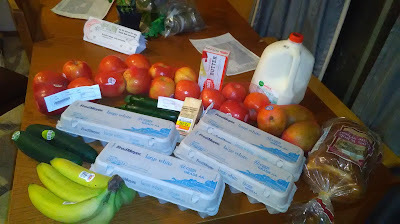 I also bought 'clean-ish' creamer for $2.00 each and organic apples for $1.49/lb. I spent $52.64. I didn't get back to Fred Meyer until Friday. I was super excited to see daiya pizza for just $5.99 each! These are normally $8 and Fred Meyer and $10 at QFC. I bought 3 pizzas, 3 organic cucumbers, 2 - 2# bricks of cheese, and 2 nitrate free kielbasa. I spent $35.80. Friday I also went to Grocery Outlet and found all sorts of good stuff. 12 pack Quaker granola bars were $2.99 so met my price point of $0.25 each, chocolate wafer cookies were $0.99, Oreos were $0.99, organic granola bars were 6-packs for $1.49, cup noodles were $1.99 for a 12-pack, olives were $0.79, big boxes of graham crackers were $2.99 (good for camping), snickers minis were only $1.25, and annies cracker packs were $2.99. I also bought a case of vitamin water for DH were $0.69 each and some bananas. I spent $65.42. Saturday afternoon I was at Fred Meyer with a kiddo. I spent $23.10 on 9# of organic potatoes, 3# onions, 3 boxes of Honey Nut Cheerios, 4 loaves of bread, & 2 more daiya pizzas. I laid it all out for a photo, then put it away without taking a photo. Saturday night DH and I had a sitter so we went out to dinner and used our last half hour to check out a new Fred Meyer we were near. We ended up buying 3 more boxes of cheerios, 2 boxes of Ritz, another daiya pizza, a gallon of organic milk, a little container of organic sour cream, another 2# brick of cheese, 6 yogurt cups, frozen fries, and a package of skittles for DH. I spent $33.19 on that visit. Sunday I was back at Fred Meyer. I know . . . I bought 2 more daiya pizzas (she eats about one of these a week because we have pizza as a family about once week), a clearance deli chicken, a bag of chips, daiya cheese, bananas, sour cream, cream cheese, marshmallows, & tomatoes. I spent $25.69. This week was pretty average as dinners & shopping go. I stopped into Fred Meyer Tuesday for a couple things to finish dinner. I hurried home with them, dropped them off with the sitter, and raced off to meet DH for a dinner date. So no photo. I spent $24.27 on a can of beans, a can of corn, two gallons of organic milk, bananas, oranges, clearance fresh mozzarella, and a dozen clearance donuts. 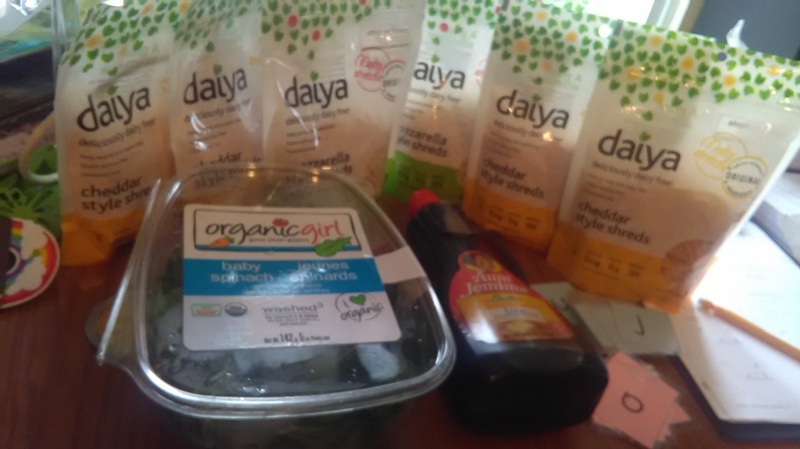 I popped into QFC Thursday to grab dairy free cheese and dairy free sour cream. Poor DD2 had been without them for about a week and she'd missed having them for two Mexican meals. I ended up finding all sorts of things in clearance including Envirokids cereal, Chex, natural peanut butter for $0.99 each, baby food for $0.69 each, penne for $0.59, chicken noodle soup for $0.59, organic black beans for $0.49, corn for $0.49, and I grabbed chips for a potluck we were attending Friday. I spent $26.92. I made a big trip to Costco on Friday morning. I needed a few things and had said I'd bring watermelon to our Friday potluck. So I spent $149.32 on a watermelon, a bag of organic brown rice, two boxes of organic fruit snacks, cheerios, chicken nuggets, naan, curry sauce, a loaf of gf bread, a bag of organic tortilla chips, veggie straws, cheetos, a 6 pack of organic mangoes, a bottle of wine, 2 packs of organic chicken thighs, tortillas, organic salsa, & coffee. This week I went to Costco on Monday and put my receipt in my jeans pocket instead of my wallet. DD1, bless her, promptly washed it in my jeans. I know from my bank statement when I spent and I think I remember the non-food items I bought. So I think I spent about $105 on: 2 bags organic tortilla chips, curry, rice crackers, triscuit crackers, granola bars, organic chicken thighs, organic romaine, organic carrots, organic butter, & sausage. I had a quick trip to Albertsons' while my kids did homeschool testing on Friday. I spent $24.83 on cheese, 2 big packs of string cheese, organic half & half, 2 bags of candy, 2 packages of little smokies, and bananas. My sweet friend participates in a gleaning ministry and I helped her out with carpooling for the homeschool testing. She shared all this great stuff with me that needed to be used up quickly! 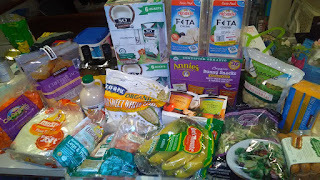 Breads, lettuce, basil, tomatoes, 2 peppers, 2 apples, parsley, a pizza, 2 vegan dinners, 2 packaged salads, GF cupcakes, a few bagels, a few ciabatta rolls, 11 eggs - What a blessing! And most of it was organic, too! I almost never shop at my local Safeway because they never have enough checkers and people are grumpy. I stopped there Saturday though because we were right in that shopping center & I needed mozzarella cheese. I found all sorts of deals in addition to the cheese and was feeling pretty good about my trip. Then I headed for the checkout and remembered why I don't shop there, Lol. I got clearance pot roast, soy yogurt, big pizzas for $4.00, pasta sauce, half & half, corn, sausages, & a chocolate egg for the kiddo who was along. I also bought milk, some 'enhanced' water for my sick husband, & 2 mangos. I spent $46.13. I stopped for milk & bananas Wednesday and hit the jackpot! QFC had clearance 'simple truth' ground beef for $0.99/lb! It's 91/9, too. I bought 16 packages. I also bought 4 packages of clearance organic beef chunks for stew and 3 organic whole chickens on clearance for $1.79/lb which is cheaper than Costco's $1.99/lb. I also bought 3 organges, sour cream, ice cream and so delicious non-diary ice cream, a clearance canteloup, a dozen eggs and 2 clearance pizzas. I spent $114.97! Friday I stopped in at QFC again for more milk. I couldn't turn out the amazing deal on Cap'n Crunch cereal. My kids generally eat really healthy and sugary cereal is a treat reserved for camping so they were amazed and delighted to see all this. It was just $0.79/box! I also bought a couple bags of chips for $1.99 each, a few tomatoes, more eggs, 2 boxes of clearance spinach and that milk. I spent $22.90. Sunday I took DD2 on a take. She was looking for pez candy for her sister's birthday that's coming up. 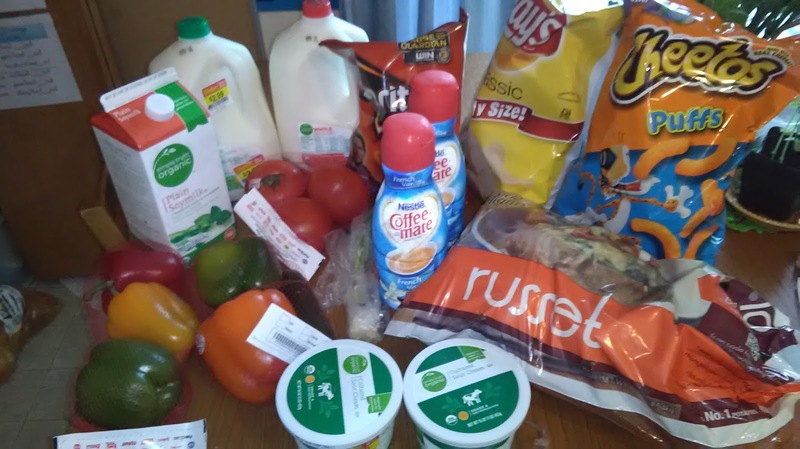 We found it at Fred Meyer where I also bought 2 gallons of milk, 2 low-ingredient Darigold creamers, graham crackers, organic cucumbers for $0.99/each, organic potatoes for $2.49/3 lb bag, cheap tortillas $0.99, daiya cheese on sale for $4.57, a clearance mozzarella cheeese ball for $2.99, a daiya pizza for $7.99, and an impulse purchase of double Reese's for $1.00. I spent $45.33. We looked for pez at the Dollar Tree before going to Fred Meyer and I spent $8.00 on pepperoni, olives, and marshmallows. Week 16 was great around here. I did lots of LuLaRoe research, including buying a new ipad (eep! ), school got done and we even managed a field trip and a sleepover. It feels pretty good when things are in balance-ish. OK - I went to Fred Meyer Sunday night for milk and mustard. I ended up buying tons. cereal - $3/5 each and I had a MC for $2/5 so they were $1.27 each. I popped into QFC Friday morning for parsely and rushed around to clearance areas. I intentionally didn't grab a cart, but managed to spend $16.85 on clearance pico de gallo, $1.99, clearance deli chicken, $2.69, clearance Caprese salad for $1.29 each, and organic ground turkey for just $0.99/lb! Finally, I shopped once more on Sunday evening, late after book club. I spent $40.62. I spent a big $189.49 this week! Plan for the week. I'm busy researching & learning about LulaRoe and related technology. The scariest part for me is technology. I love to talk to people. I don't mind asking for help & praying like crazy. I'm looking forward to helping ladies feel good about clothes and working my tail off to get this product in front of as many people as possible. But wow, the technology piece is scary. I have to learn new software, new apps, and a lot of LLR things run on apple apps. I've never owned Apple products since my husband works for Microsoft. I also have to learn how to do live feeds, Instagram, and something called periscope. So I've got major work to do! I haven't posted for 2 weeks so I have two weeks of groceries to get through tonight. I'm exhausted. DH and I have been staying up late the last couple of weeks researching, watching videos, and learning about LulaRoe. I'm planning to start a business and we're 95% committed. OK - Monday of Week 14 I went to Fred Meyer for their eggs on sale. I wanted some for Easter. I also bought an organic cumber, a pound of butter, bread, zucchini, clearance Pink Lady apples, clearance mango, a gallon or organic milk, bananas, cucumbers, & zucchini. I spent $24.74. 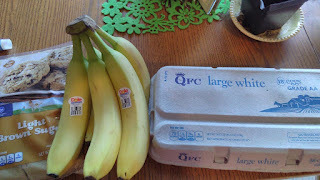 Wedneday I dropped to QFC for items needed for company coming for dinner Thursday including milk, potatoes, whipped topping, green onion & sour cream. I was happy to find some organic milk on clearance and the organic sour cream on clearance. I had all the kids with me so I got talked into potato chips. I also bought creamer, bell peppers on clearance. & tomatoes on clearance. I spent $41.20. I was back at QFC Friday morning because I had forgotten a couple things on Wednesday including df sour cream and a gf/df pizzas. I also found a tub of organic cream cheese on clearance. No photo. I spent $15.67. One more time to QFC on Saturday for a kiddo date. I bought organic chicken breast on sale for $5.99/lb and found croissants, organic cottage cheese, and cheese curds all on clearance. I spent $17.55. p.s. Sorry for the stretched images. I downloaded from my phone and they're not formatting the usual way. Thursday I was back at QFC, but this time it was while another kiddo was in a 30 minute appointment on a packed day. We dropped off DD4, raced to the store, zipped in (with 4 kids), grabbed 3 items, & zipped out. I spent $5.70 on bananas, eggs, & brown sugar. I spent $18.37 at QFC on Friday night. I found a bunch of stuff on clearance including toddler cookies, campbell's soup, 3 apples, several candies, lots of string cheese, and skinny girl chocolate candies. Lots of good bargains! Sunday afternoon I went to Costco. I spent $83.70 on groceries, but used a big rebate to only actually spend $17.53. I'm recording the $83.70 though to try and keep my grocery cost accurate. 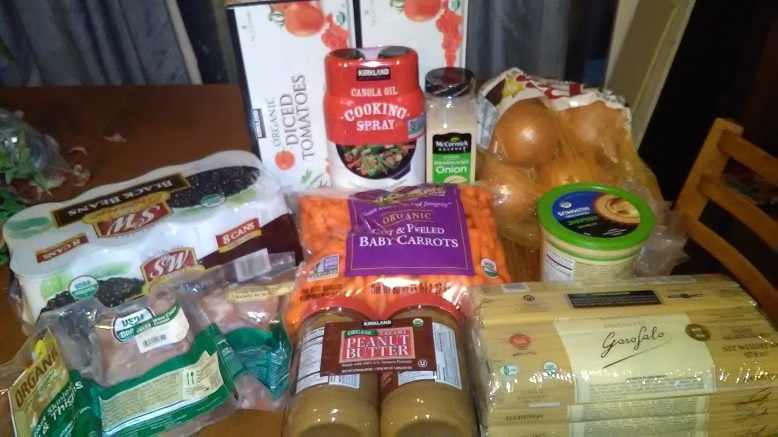 I bought an 8 pack of organic spaghetti, 2 cases of organic tomatoes, a case of organic black beans, cooking spray, organic chicken thighs, organic carrots, organic peanut butter, organic yellow onions, organic hummus, onion powder and organic tortilla chips. Typical week, not too busy. 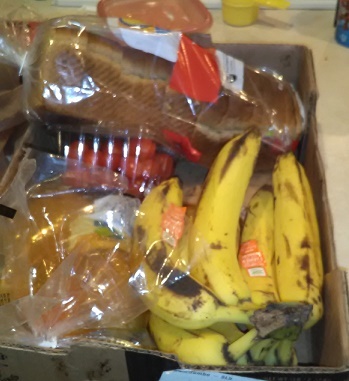 My friend who gleans shared some items with me including a loaf of organic bread, a box of organic grape tomatoes, organic potatoes, & bananas. I was thankful to get it and I worked it into my meal plan for the week. I went to Fred Meyer Monday afternoon for milk and ended up spending $42.15 on all sorts of stuff. I bought the milk, 2 bags of chips, 2 packages of clean hot dogs for $2.99 each, chicken strips for $6.25 & corndogs for $3.75, chocolate milk for $1.00, clearance creamers for $1.89 each, a gf/df pizza on sale for $7.19, saltines for $0.99, and 3# organic potatoes for $2.49. Friday I dashed into QFC for 4 bags of chips and a macaroni salad for our potluck contribution. I spent $14.25! Later that night I was back at QFC since we needed milk. I found ricotta on clearance for just $0.99 each so I bought big shells to make stuffed shells. 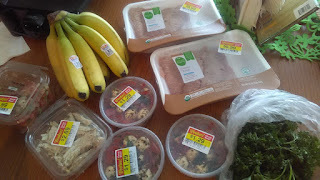 I bought some gf, acient grain chips in clearance for $1.99 each, clean guacamole on clearance for $1.79 each, a deli chicken on clearance for $4.79, a big package of pepperoni, an organic bell pepper and a lemon. I spent $44.52. I stopped into QFC today just to see what was there. I found organic stew beef on clearance for $7.49/lb, organic hummus for $2.49, some bananas, & baking powder. I spent $21.59. Another big week, but I feel so much better about having my fridge stocked! Monday I went to Fred Meyer late at night. We needed milk, cheese, and I wanted some hamburger patties to use up leftover hamburger buns. Cereal was on sale 3/$5 for I picked up 3 boxes that didn't ring up correctly and I'm only now noticing - RATS. I got 2 coffee creamers for $1.99 each, chicken nuggets for $4.99, and a package of cheap hot dogs for $1.49. I hate buying cheap hot dogs, but DH asked for them. I bought regular corn dogs for quick, easy lunches because they were on sale. I bought a couple bags of chips for kid treats with a store coupon making them $1.51 each, a bag of tortilla chips for $0.60 after coupon, shredded cheese for $2.68/pound after a coupon, and organic yogurt for $2.79 for a big tub. On clearance I found a loaf of organic bread for $1.79 and lunchmeat ham for $2.99. Milk was on sale so I got two gallons & those hamburger patties were just $5.49. I also bought some brick cheese. $3.00/lb for Kroger and a no-dye cheddar loaf from Darigold was $5.79. I spent $69.05 altogether. I knew I needed Daiya cheese, but it was $4.99 at Fred Meyer. So I got online Wednesday morning and found it for $3.89 on Amazon Now. So I placed an order, also buying organic spinach for $3.99 for a dinner I made this week and syrup so I could use up some pancake mix on a kid lunch. I spent $30.31 on this delivery. Friday night, DH and I had a date night. We saw an early movie, ate pizza together at Costco and shopped. I bought 2 cases of organic coconut milk since it was on sale, feta cheese, Annie's snacks that on sale worked out to $0.25 each snack (my price point), organic garlic cloves, organic frozen corn, organic syrup, organic baby carrots, organic salad mix, organic sausages (also on sale so $3.99 per pack in stead of $4.99) for the kids' lunches, and organic chicken thighs (the small package possible), and conventional brick cheddar for just $4.99, feta (again, the smallest package possible), tortillas, shredded cheese for $2.59/lb, curry sauce I love, bananas, & oranges. I spent a big $159.59. And I reassured my husband that even buying a lot of organic food, I spend less than most folks buying conventional groceries. I think. I had a date with DD1 this afternoon and we ended up at the Dollar Store. I bought some ramen & cup noodles. Then we went to Haggen since we were in the neighborhood and I got organic romaine heads for $2.79 each bag of 3 and some no-dye Darigold cheddar for $5.49. Between the two stores I spent $13.07.